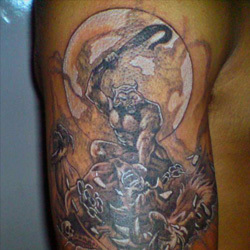 For people who are looking to convey their inner power and ferocity, a beast tattoo is an excellent choice. While there are some specific beasts that are part of myths and legends, almost any animal can be given beast-like qualities through enhancing and exaggerating its physical features. Devouring beasts are an especially potent tattoo, and will demonstrate to people that while you may be gentle in appearance and a lover of Mother Nature and all her creatures, underneath you are ready to take on anything. The beast also has great biblical significance. In the Book of Revelation, 'the mark of the beast' is something that everyone will be required to receive at the end of days, no matter their station in life. Though there is debate about what exactly this 'mark' might be, some people believe this beast to be apocalyptic and associated with the number '666'. The dark and mysterious nature of this biblical beast makes it a potentially menacing tattoo, and may be well-suited for people who practice Satanism or other dark arts. 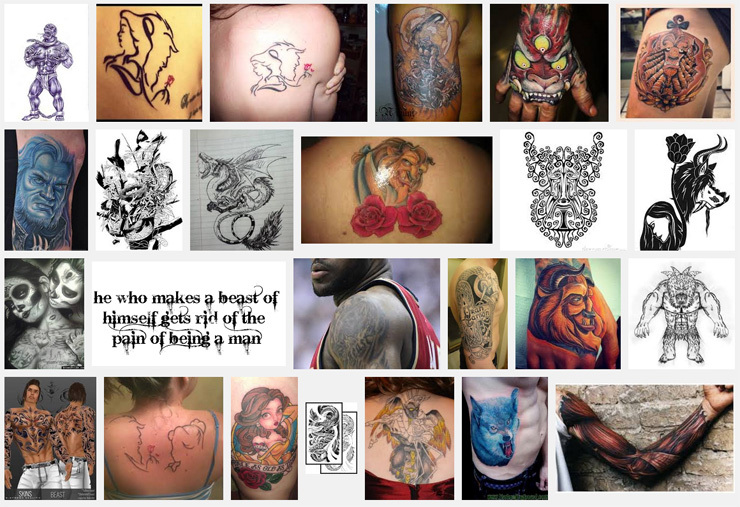 But despite these rather fearsome connotations, a beast tattoo can have a gentler meaning as well. In particular, the beast is featured in a beloved fairy tale, "Beauty and the Beast", which many people will have fond memories of from childhood. 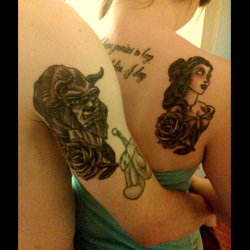 Getting a beast tattoo can represent the original fairy tale or the cinematic Disney version, depending on your design. Whether you opt for a traditional or Disney interpretation, the essential story and meaning will be the same: here, the Beast is a creature whose love and devotion to another person eventually sets him free of a wicked curse, demonstrating the power of true love. Within the different categories discussed above, there are several different variations and design choices for your beast tattoo. If you have trouble designing a tattoo that represents the meaning you wish to impart, work closely with a tattoo artist to help your vision become reality. 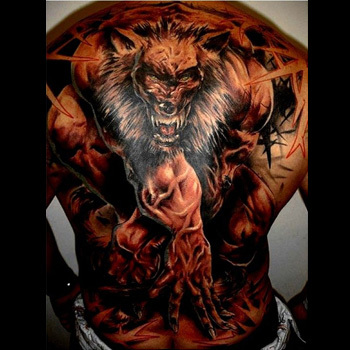 This is possibly the most popular incarnation of the beast tattoo, and is popular with both men and women. The Disney film from 1991 won hearts around the globe, so basing your design around these particular characters and images will make your tattoo instantly recognizable. One design option for your Beauty and the Beast tattoo is an outline of the Beast's and Belle's silhouettes as they are back to back. The outline is done in black with the two characters linked, with the Beast holding a vibrant red rose: the rose symbolizes his need to win Belle's love, which becomes more and more urgent each day as a petal falls from the rose. Another option would be to have the Beast holding his magic mirror, which can see Belle wherever she is; including an image of Belle in the mirror would add another character and element from the story. The original French fairy tale dates from the mid-18th century, and incorporating some of the earlier imagery will make it clear that you are representing this version of the fairy tale, as opposed to Disney's version. In many images of this fairy tale, the Beast is depicted with much more discernably animal-like features: sometimes he is shown as wolfish, or lion-like, or even as a bull with horns, in some ways even more menacing that the Disney character. A rose bush, and not a single rose, is an important element of the original, so including this in your beast tattoo design will make the link to the French fairy tale all the more clear. A third option is a cheeky couple's tattoo: one partner gets 'Beauty' and the other partner gets 'Beast' tattooed on their body, but who gets what signifier is up to you two! This tattoo can be done just in script, or images of Disney's Belle and the Beast, or those from the original French fairy tale, can be added. Sometimes 'the mark of the beast' is interpreted as a futuristic 'Big Brother' technology in which all people will be marked with computer chips or barcodes in order for the government to keep tabs on its citizens. 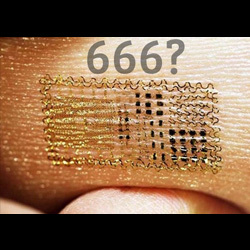 For this reason, some people get a computer chip or barcode tattooed onto them in order to signify the mark of the beast. Personalize this option by including numbers on the barcode or chip that have personal significance to you: perhaps a birthday, anniversary, or memorable date. If you'd rather go the apocalyptic route, then you have several options for depicting this biblical beast. 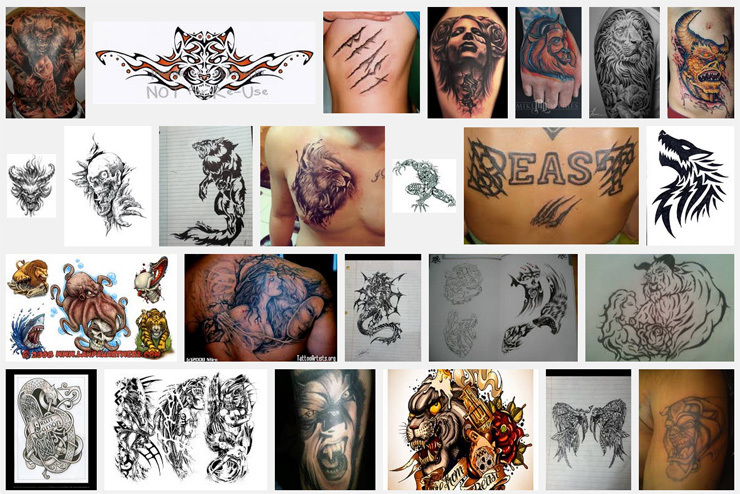 The mysterious nature of the beast opens up the possibilities for designing a tattoo: pretty much anything goes! In order to maintain some specificity and link your tattoo with the beast featured in the Book of Revelations, opt for a more devilish design: incorporating glowing red eyes, horns, or the number '666' into your beast tattoo will immediately connect it to the prophesized apocalypse. Depicting a particular animal in a more beast-like state can demonstrate the dual nature of your personality: you might be soft and fuzzy on the outside, but in side you are brimming with ambition and ready to do whatever it takes to make it far in life. Showing off an animal's teeth and open jaw, or having one in a crouch position, as though it is about to pounce, are ways in which even the gentlest of animals can take on fiercer qualities. Depicting an animal in this beast-like fashion demonstrates your hunger for power and success: you are ready to eat the competition alive! To add even more unique and personal meaning to this tattoo, have the beast devouring the embodiment of an enemy, be it another animal or a symbol or word representative of your fears. Beast tattoos are capable of imparting a wide variety of meanings, and each individual will have their own unique reasons behind this tattoo. Both men and women can get any of the beast tattoos featured above, as we all have that inner beast inside of us somewhere! For custom design of a Beast, you can check our Custom Tattoo Page.